That was the post-race motto assessment on my part. Of course I would wanted for a faster race, but my legs just wouldn’t have it. I’ve lost fitness and I have to work to get it back, so I have to start somewhere, but let’s start at the beginning. Rob and I did not stay in Chicago the night before the race. Instead we choose to stay home and make the drive up in the morning, which without any traffic is just over 2hrs. We got up at 3:30am and got ready and were on the road by 4:45am. I added some green to my running outfit to be festive. 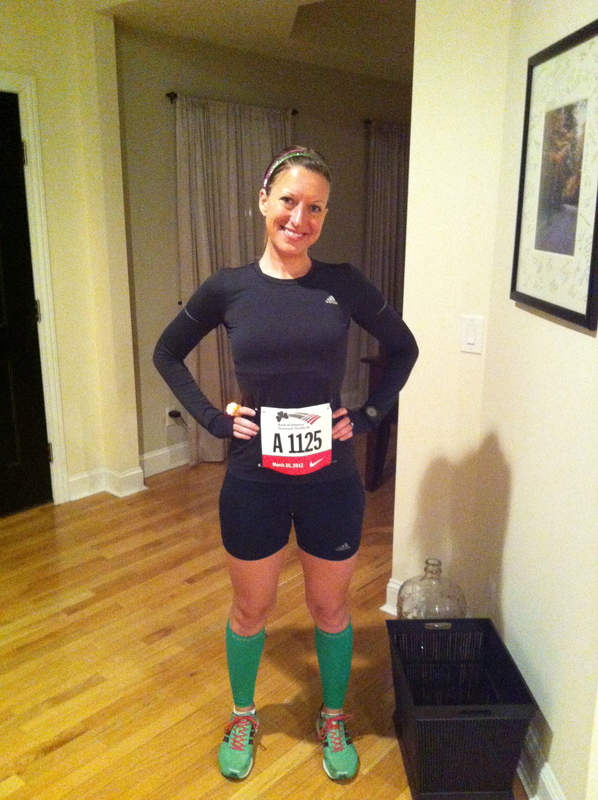 I had my green gummy ring that lights up, Zensah green compression calf sleeves and green adidas adios. My stomach as been rock solid normal now for coming on two weeks. It has been crazy good. I really hope that my stomach troubles are behind me. My doctor did advise me to try taking an Imodium on race day just to see if that ensures that things stay good during the race. This was just under a 5 mile race, so it wasn’t a big test, but things did go well in that department. The drive was relaxing and easy with the traffic being so light. We got parked in Millennium Garage off of lower Randolph Street with no issue. We then made our way over to Starbucks on Michigan Avenue that is between Monroe and Randolph. We got a couple tall soy mistos and took a seat at the window and chilled for 45 minutes before making our way to the car one final time and then to the start corral. Something funny that happens it seems every time we go to a big Chicago race is we run into our friends without even planning it. I don’t think we could plan it better if we tried. Ryan and Melisa were there to race, Ryan as an elite no less and Mike and Erin (also runners) were there for race support for them. Such a rockstar group and so good to see them before getting into the race. Rob and I didn’t get into much of a warm up before we were lined up and ready to go. The weather was outstanding for the race. Overcast, mild temps (50s) and the lightest breeze. Ryan gave us the great advice of making sure to start slow for this race. He warned that even more than other Chicago races like Chicago Marathon people take off super fast and drop off after mile 2 or 3. He warned that it’s a tricky distance and many people go all out like it’s a 5K. Rob and I took the advice to heart. In my case, I’m out of shape so I would just start off easy and then try to add speed if I could find it. The race did move quickly and with 8 turns durning less than 5 miles the time flew by quickly. Here are my mile splits to show that I have a lot of work to do. 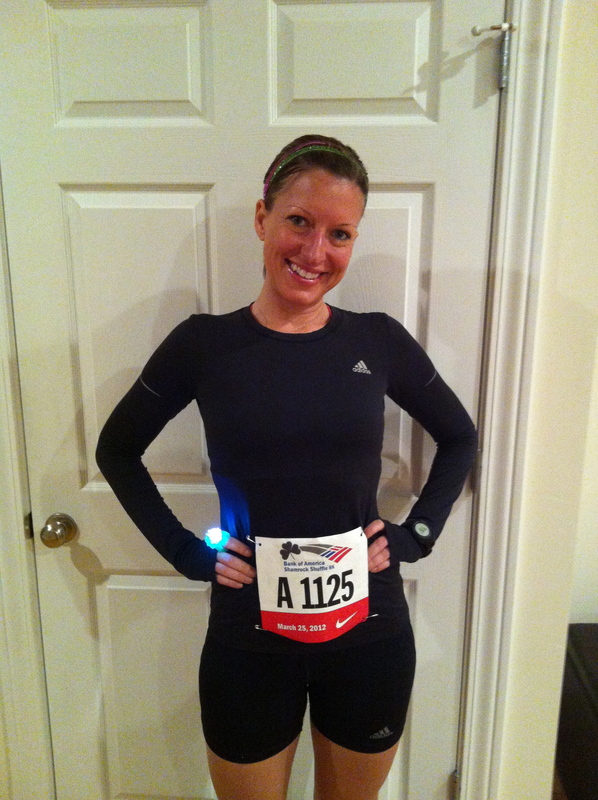 I would recommend this race to those who plan to run Chicago Marathon or other Chicago races. It gives you an idea of the logistics for the morning. Since this race has two waves make sure to have a meet up location selected ahead of time with any friends or family. The barricades are different than other Chicago races we’ve done because of the multiple wave start. We never saw a “family meet up area” with the letters on pillars (A-Z) for people to find each other so I’m glad we had a meet up plan ahead of time and we had no trouble finding each other. Categories: 8K, Chicago, Race, Travel | Permalink.